At least 2 million people in the U.S. become infected with so-called “super bugs” and at least 23,000 people die as a direct result of these infections each year, according to the Centers for Disease Control (CDC). 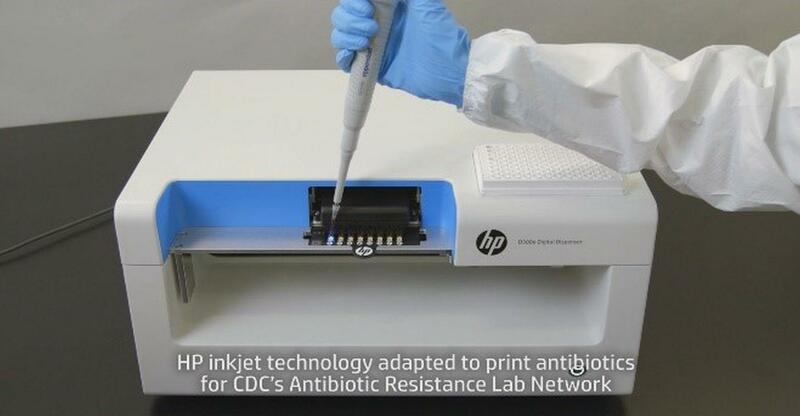 Now, HP’s Biohacker technology is working with the CDC on a pilot program to “print” and test antibiotics in an effort to catch these antimicrobial resistant strains from spreading faster. The HP D300e Digital Dispenser BioPrinter technology works by using the same set up as a regular ink printer, but instead dispenses any combination of drugs in volumes from picoliters to microliters to be used for research purposes. Part of the reason these bugs spread so rapidly often comes down to mis-use of antibiotics, leading the bacteria to develop a resistance to the drugs available. The CDC hopes to give hospital providers access to the technology nationwide to cut down on the problem. The 3D bioprinting sector has been experiencing rapid growth over the last few years and will continue on pace through the next decade, mainly due to R&D, according to market researchers. Innovation in the space includes printing of organs and human tissue and drug research and development. Further, this potentially valuable antibiotic resistance research could help patient care teams stem a grim future where we experience a regression in health and life spans due to no longer having the ability to treat currently curable diseases. The HP BioPrinter is currently used by labs and pharmaceutical companies such as Gilead, which tests for drugs used against the Ebola virus. It is also being used in various CRISPR applications. The CDC will use these printers in four regional areas spread throughout the U.S. within the Antibiotic Resistance (AR) Lab Network to develop antimicrobial susceptibility test methods for new drugs, according to HP.